At the Macworld Conference & Expo in San Francisco, Apple CEO Steve Jobs took the stage Tuesday to introduce the company's latest technologies. As rumored, Apple launched a new, super-slim version of the MacBook laptop computer, known as the MacBook Air. Jobs also introduced a new version of the AirPort Extreme Base Station known as Time Capsule, which combines an 802.11n router with a wireless backup storage solution. The MacBook Air does not replace any of Apple's existing laptops (which include the 13.3-inch MacBooks and various higher-end MacBook Pro models). The new unit is designed to fill the niche for ultra-slim but full-featured notebooks. 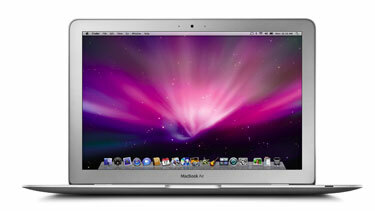 At its thickest point, the MacBook Air measures 0.76 inches, tapering down to 0.16 inches at its thinnest. So what about the optical drive? Lacking that, Apple has come up with a new technology that allows the MacBook Air to "borrow" the optical drive of nearby Macs or Windows-based PCs for installing software or performing functions for which the optical drive is normally used. The technology even allows Windows PCs to load and run Mac software discs for remote use. The base MacBook Air runs $1,799 (retail) and will be available in two weeks. It's available for pre-order now. Either 500 GB or 1 TB of storage. Time Capsule is expected to ship in February for $299 for the 500 GB model and $499 for the 1 TB model.